That quote comes from a recent survey (TVID: F45-958-E6A) conducted by TechValidate, an independent research firm that has been speaking with a whole range of PrinterLogic customers about their honest firsthand experience with our print management solution. And the findings are turning out to be remarkably consistent across industries and company-specific environments. Time spent on print management and print-related service desk calls each dropped by 15%. Printer downtime was cut by 30%. Those percentages can be rewritten as dollar amounts. The “payback period” in which PrinterLogic’s ROI covered all the costs related to its installation was 12 months. That’s just one year to reach the break-even point in terms of cost alone. 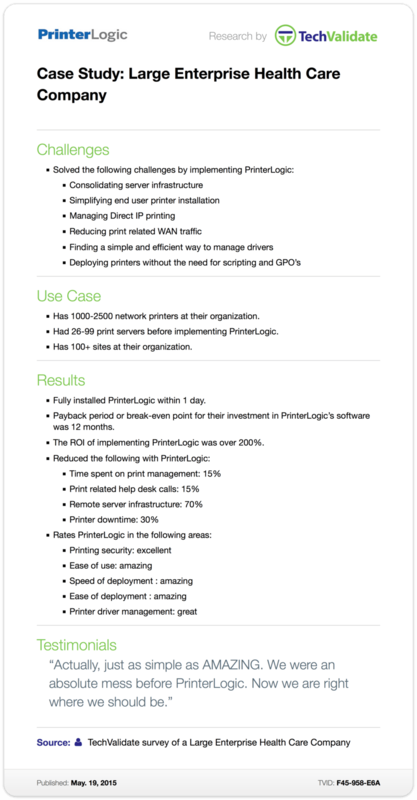 What’s more, the total ROI of implementing PrinterLogic so far has exceeded 200%. Of course, as important as ROI is, PrinterLogic delivers far more than that. By installing PrinterLogic, this large-enterprise health case company is now able to deploy printers quickly and efficiently without requiring scripts or group policy objects (GPOs). It can manage software drivers, print queues and networked printers with ease but without sacrificing full administrative control. It’s reduced print-related WAN traffic through PrinterLogic’s direct printing and compression features. Plus the company has succeeded in consolidating its server infrastructure, thereby slimming its hardware footprint and the resources that are continually allocated to maintaining that infrastructure. So whether you put it in numbers or adjectives, this large-enterprise health care company’s migration to PrinterLogic points to just one thing: an undeniable and ongoing success.